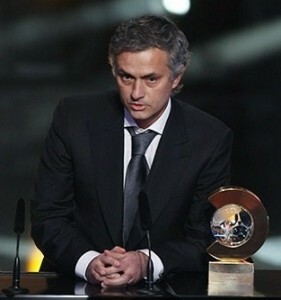 JOSE Mourinho has donated the most prestigious personal trophy of his glittering career to the charity auction in memory of Sir Bobby Robson, his mentor and boss at Sporting Lisbon, Porto and Barcelona. Real Madrid’s Portuguese manager, 48, was award Fifa’s Ballon D’Or World Coach of the Year award in 2010, the year he won the Champions’ League with Internazionale. He beat off competition from World Cup winner Vicente Del Bosque and rivals including Carlo Ancelotti, Pep Guardiola and Sir Alex Ferguson to pick up the award. Now he is donating the trophy he received as an auction lot in memory of Sir Bobby, who died two years ago at the age of 76. The online auction, from 8-23 October, and a charity ball next month will raise funds for The Sir Bobby Foundation and Breakthrough Breast Cancer. Mourinho has recognised the part Sir Bobby played in his own football development by giving the wonderful money-can’t-buy prize – to the delight of organisers and the Robson family alike. The auction has also been supported by HRH the Prince of Wales and Prime Minister David Cameron. Auction founder Gina Long added: ‘When I started planning the auction, I could only have dreamt that I would get support from such magnificent people and great companies. Mourinho is just the latest manager among the biggest names in the game to donate auction lots and pay tribute to the influence of Sir Bobby. Chelsea’s Andre Villas-Boas has given a donation (link here), as has Manchester United’s Sir Alex Ferguson (link here) and Leicester’s Sven Goran Eriksson, a former England manager, as Sir Bobby was. The Swede said: ‘Sir Bobby was a father of the game of football. You need only look now at the number of people within the game he influenced, to see his legacy. ‘As a young coach, starting out in my career, I visited Sir Bobby whilst he was the manager of Ipswich Town. Despite how busy he must have been that day, as they faced Aston Villa, he spent time with me discussing his team selection and his tactics for the day. ‘He was a true gentleman, with warmth and sincerity, who gave his life to the game and to his family and friends. There are probably hundreds of icons from the world of sport, but maybe just a handful who transcend popular culture and everyday life. Sir Bobby did just that. He is in the hearts and minds of all of us and he is still missed today. Sportingintelligence is proud to be among the supporters of the auction. A chance to attend England national football training as a guest of Fabio Capello … A chance to play a match at Sir Bobby’s old club, Ipswich Town, with two winning bid teams being trained by Robson-era stars and using the dressing rooms, executive box and boardroom … Tickets to the glitzy, star-studded PFA Player of the Year award bash next April … A rare, signed, limited-edition copy of the autobiography of Pele … one of John Motson’s commentary charts from a big game … the signed Chelsea shirt, tickets and chance to meet Villas-Boas … an England Shirt signed by the majority of the squad involved in the recent friendly with Ghana … hospitality and premier enclosure badges at Newmarket races … a pair of Centre Court tickets in the first week of Wimbledon2012 … a pair of tickets to the final of the Masters snooker at Wembley in January … a racing shirt signed by the British Touring Car Championships drivers, Gordon Shedden and Matt Neal … a framed print of the old Wembley Stadium, signed by Bobby Charlton and Sir Geoff Hurst … a day at “The Audi Driving Experience” at Silverstone, with qualified instructors flown in from Germany especially … a Liverpool shirt signed by Andy Carroll (and match tickets). A full list of ‘money can’t buy’ lots, with more to come, can be found at www.sirbobbysbreakthroughauction.com. The auction takes place in October, online.